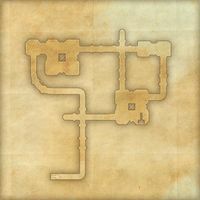 The Dwarven ruins of Mzithumz are well known to house constructs and automatons that are still active and mobile—which makes them far too dangerous to enter as far as the locals are concerned, despite the resale value of Dwarven mechanisms and parts. 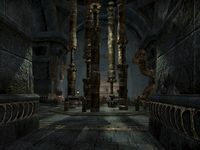 Mzithumz is a Dwemer ruin in northern Deshaan, north of Mournhold. Mzithumz Objective: Investigate the attack on a Hlaalu caravan. Mzithumz Wayshrine is located near the shore south of the ruin. 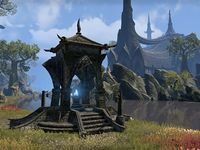 Prior to the introduction of One Tamriel, this area was level 18. Speaking to Raynor Vanos reveals he knowing sold something he knew may malfunction, for "field-testing".